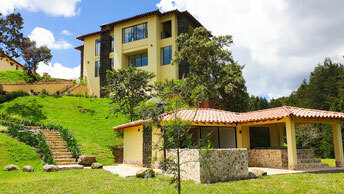 Spectacular elite house, designed as a combination of classical European villa and traditional Colombian finca, located in a quiet picturesque place in the mountains not far from Rionegro. The natural slope and contours of the property have been ingeniously included into the architecture in order to provide an exceptional panoramic view across the valley from each window of the house. The layout of the finca is well thought-out and created to make the owner’s life comfortable: Spacious rooms, light-flooded halls, cozy living room with panoramic windows, big and exceedingly well equipped kitchen and noble dining room, sunny terrace, four bedrooms, many bathrooms and wardrobes and a 250m2 hall to be used as a gym or as an event room. 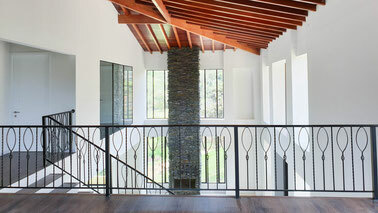 But besides functionality, the interior of this three-story house enchants you with its warmth. The calm and classical interior is made of natural wood and stone. A fireplace in the living room creates a cozy and homely atmosphere. The house is surrounded by forests and a beautiful garden with an own lake, water cascades and private beach, created with love by famous Anthony Archer-Wills of “The Pool Master”. The detached summerhouse by the lake is fitted with a Jacuzzi and a built-in BBQ-grill and strikes with its versatility. In this compound you will definitely find your privacy and opportunity to relax. Ground Floor: Hall planned to be a gym or an event or leisure room; bathroom; panoramic windows, access to the terrace. First Floor: Main hall, living room with fireplace, kitchen, dining room, office with panoramic view, lavatory, laundry room and room for domestic servants Second Floor: TV room, two bedrooms with walk-in closet and ensuite bathroom, one master bedroom with walk-in closet, ensuite bathroom, balcony with lake view and outdoor jacuzzi. This summerhouse offers everything you may need for the perfect relaxation. It overviews the lake and the garden. Inside there is a well equipped kitchen and the fireplace in the living room gives the summerhouse some extra atmosphere. On the terrace there is a BBQ-grill for outdoor cooking. The summerhouse provides a bathroom with a big shower and an outdoor jacuzzi and has been designed for a sauna or steam bath to be installed. This building can be used as an apartment for guests or as an accommodation for domestic servants or security guards. It has an open kitchen with dining/living room, a bedroom with a walk-in closet, a bathroom and a lavatory. The separate garden at the backside of the house guarantees maximum privacy for the guests as well as for the hosts. 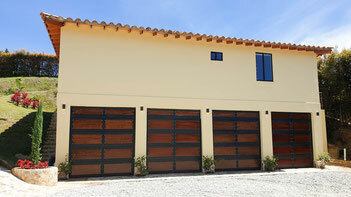 A 4-car garage with automatic doors is placed below the apartment. The guest house as well as the main house are both equipped with talkback bell and video. This is the only property in Colombia with a lake and garden designed by Anthony Archer-Wills, the most renowned garden designer known from the TV-Show "The Pool Master". The doorway of the fenced in property welcomes your guests with its official design. Visitors are enchanted by the 60 different fruit trees at the frontside of the main house. Next to the summerhouse you find a big ground for outdoor games. A garden with water streams and native trees preserve the property’s natural feel. The streams flow over 3 waterfalls into the big swimming pond. A private beach is located in a cove at the end of the lake where absolute privacy is guaranteed. This finca is the last architectural complex in a small urbanisation. Therefore it is very private and quiet. 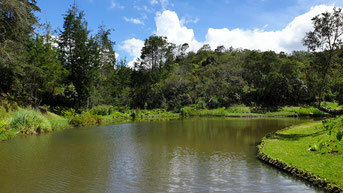 Located in front of a natural forest in a rural area it shelters a variety of beautiful exotic birds. 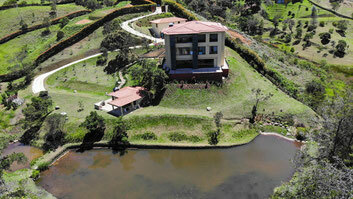 Nevertheless it is close to the city of Medellín and accessible on paved roads. The tunnel opening in early 2019 will shorten your trip to Medellín to about 20 minutes. The airport MDE is just 10 minutes away. Rionegro and Llanogrande are the closest two bigger urban regions. 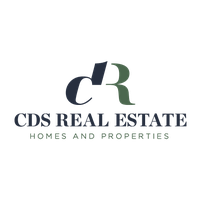 They offer many shops, restaurants, movie theaters and anything you might need. 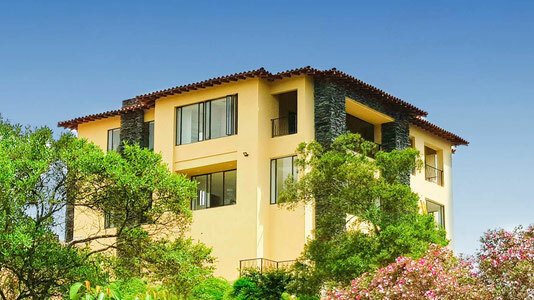 Infrastructure like the highway to Bogotá, the tunnel, the connection to touristic Guatapé and the modern and well renowned hospital of Rionegro make this upcoming region very popular.